Great and almighty is our sovereign and triune God, and we cannot limit His power without sinning, nor can we ascribe the helplessness of the church to the greater power of sin and Satan. Rather, we must ascribe it to the heresy and laziness of believers, who limit God in their unbelief. Satan tempted Adam and Eve not to eat a delectable piece of fruit, but to consciously disobey God, to "be as gods, knowing (i.e., determining for themselves) good and evil" (Gen. 3:5). The music industry can be a rough and tumble environment. It's no place for the timid. Competition is strenuous, music can be stolen, contracts are voided for no apparent reason. A husband's care for his wife and children is essential to Christ's purposes on earth. Without the godly family, the Kingdom of God does not begin to advance. 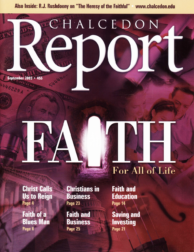 Longtime readers and friends of the Chalcedon Report know that over the years these pages have roundly censured the contemporary American view of the Christian faith, which commonly accepts eternal reward, but little temporal responsibility. The Christian who takes the concepts of stewardship and dominion seriously is becoming a rarity in American business. This is having a devastating effect on society, as business culture becomes anti-Christian. In large part, this is due to an imbalance in the way Christians have thought about work. Dave Hunt is up to his old tricks again. A popular Christian writer and apologist, Hunt has written numerous works on the Roman Catholic Church, cults, end-times, and other popular topics.